Spain is different. We’re sure that you’ll have heard or read this sentence before. Spain is certainly quite different from the rest of the world but its regions are different from each other, too. Gastronomy, culture or personality are some points of divergence between us, but also language. Spanish is different in Andalusia, Galicia or Madrid. Within the next weeks, we’ll learn more about the dialects of Spain on our blog, but today we’re going to deal with vocativos coloquiales (colloquial vocatives). What a colloquial vocative is? It’s a noun that we use to draw the attention of the listener but in a colloquial and informal way. They are closed to slangs. If you are talking to friends in English, you’ll probably listen sentences like: “what’s up, man? What’s going on, bro?, Hello, guy! In Andalusia we use vocatives like: quillo (shortened from chiquillo in Seville) and picha (Cádiz). Picha is actually pronounced /pisha/, like she in English. If our students on www.spanishviaskype.com go to Extremadura they can find acho and chacho in Murcia. Both are shortened words from muchacho. In Madrid they used to say tronco, but nowadays it’s less used. If you want to learn Spanish in the eastern areas, they often say nen (Cataluña) and che (Valencia). 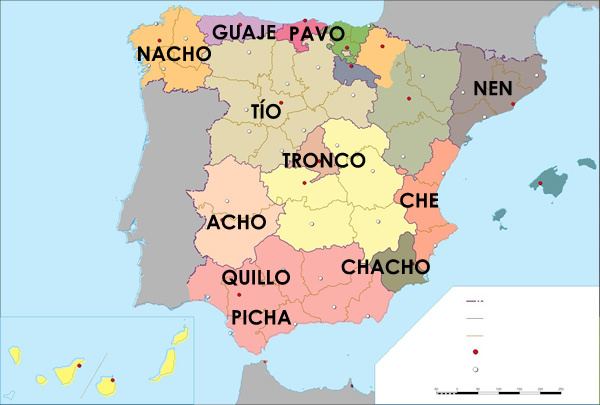 In the north you can listen nacho in Galicia, guaje in Asturias or pavo in the Basque Country. All these ones are used in those regions but there’s one that is very common all around the country: tío (uncle). So, next time you connect to Skype to start a lesson with our teachers, maybe you can say at the beginning: ¿qué pasa, tío? ¿cómo estás, quillo? ¿qué hay de nuevo, nen? But take care, because you might sound impolite. Wow, fantastic blog layout! How long have you been blogging for? you made blogging look easy. The overall look of your site is magnificent, let alone the content!. Thanks For Your article about Â¿QuÃ© pasa, tÃ­o? (B1) | SpanishviaSkype .